April 12, 2019 by Ecommerce News. About Cross-channel with tags Poland. 1886 views. About three in four business-to-business companies in Poland sell their products or services online. The majority of those retailers have been involved in ecommerce for over five years now, while half of Polish B2B companies also operate internationally. These are some of the most important takeaways from the recently released report “The B2B Buying Process in Poland: Challenges, Trends, Inspirations”, created by research company Mobile Institute and tech company E-point SA. The report aims at any B2B company, Polish or not, that’s looking for inspiration on how to improve its online ecommerce activities. The report shows that 71 percent of Polish B2B companies sell online, with 65 percent of them being active in ecommerce for over five years, while a quarter has been engaged in online sales for three or four years. Company websites account for the majority (57 percent) of sales, while direct sales are another frequently used (54 percent) distribution channel in the business-to-business industry. The companies’ own sales platform, ecommerce platforms and other ordering systems are in third place, with 40 percent. These are followed by brick-and-mortar stores (36 percent) and social media (34 percent). 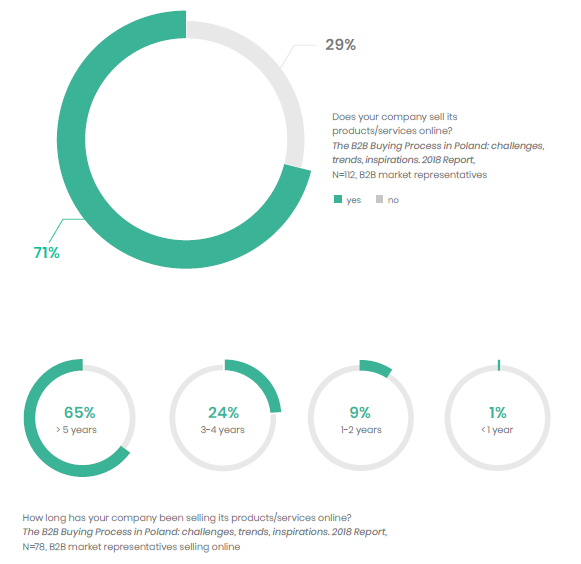 The researched also asked respondents why they buy products for their companies online. The most popular answers are: being able to buy at a time and place of their choosing (70 percent), overall convenience (67) percent and speed (65 percent). The study also shows that over a third of B2B clients would like to order products using a mobile device. When B2B professionals choose a business partner to buy products or services from, price isn’t the most important factor. The most universal factor was, by far, good terms of cooperation. According to E-point SA, this follows the global trend of B2B buyers that value good customer experience over price. “In short, Polish B2B companies are choosing safe online strategies, but they’re not fully tapping into the potential for building relationships via the online channel”, Katarzyna Czuchaj-Łagód, managing Director at Mobile Institute, says.